Would you like to be a student who makes superior grades without striving? Would you like to enjoy writing papers and experience peace during test-taking? Would you like to be so stimulated from completing an assignment that you look forward to starting the next one? Would you like to know how your study experience can be one of the most delightful, thrilling, fulfilling, and dynamic experiences of your life? You may be reading this thinking, "Studying is hard work! I struggle with procrastination, boredom, burnout, and inadequacy. You mean there's another way to approach my studies?" Yes! It's God's way to an A. And if you answered "yes" to any of the above questions, you have met the prerequisites to take the course! In a nutshell, God's way is one of relationship. Learning is a partnership with God! God is not only the source of all knowledge and wisdom, but He desires to help you study by communicating to you His will and His knowledge. Are you open to considering the possibilities of letting God help you study? In this teaching series, I will lead you in discovering God's way to an A. The book is laid out in workbook format for you to respond and apply each day's lesson. It is a seven week course with 8 audio tapes and manual. In addition, each week you will learn a new song to help you master your lesson. If you want to experience the power of God in your studies, this course is for you. Video - This 42 minute video on Lesson 1: Learning is a partnership with God will show you how to integrate your faith and learning. You will also hear inspiring testimonies from high school and university students. Audio Series - Veronica takes you through the entire course in this 8 tape series. Each of the seven lessons is divided into five segments each, so you can incorporate God's Way to an A into your studies on a daily basis. Each lesson also comes with its own theme song to help you learn the main points. The introduction tape will explain how to take the course. It also contains the seven God's Way to an A theme songs. 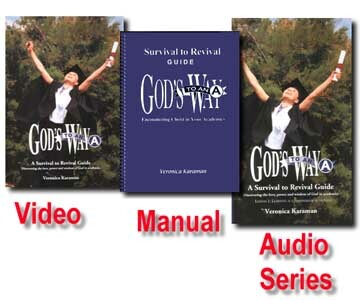 Manual - The 200 page study manual works hand-in-hand with the audio series. In addition to each week's lesson, you will reflect upon your own study experience, dig into the Scriptures, and hear other faith inspiring stories to motivate you in your own walk with God in your academics. Learn how to approach your studies from a biblical point of view. Experience greater academic success and fulfillment. Come to know God as your Teacher. Identify worldly motivations and repent of them. Learn and apply biblical motivations of faith, hope, and love. Learn how to overcome study hindrances such as procrastination, boredom, fear of failure, inadequacy, pride, and performance orientation. See your studies as a ministry to bless your professor and fellow students. View your learning as a way to enjoy God's love. Align yourself with God's destiny for your life. Begin to lead others in God's way to an A. "God healed my heart through this course." Rob M.
"I overcame procrastination and became an A student through God's Way to an A." Felicia C.
"My son is now self-motivated. I don't have to nag him to do his work." Greg M.